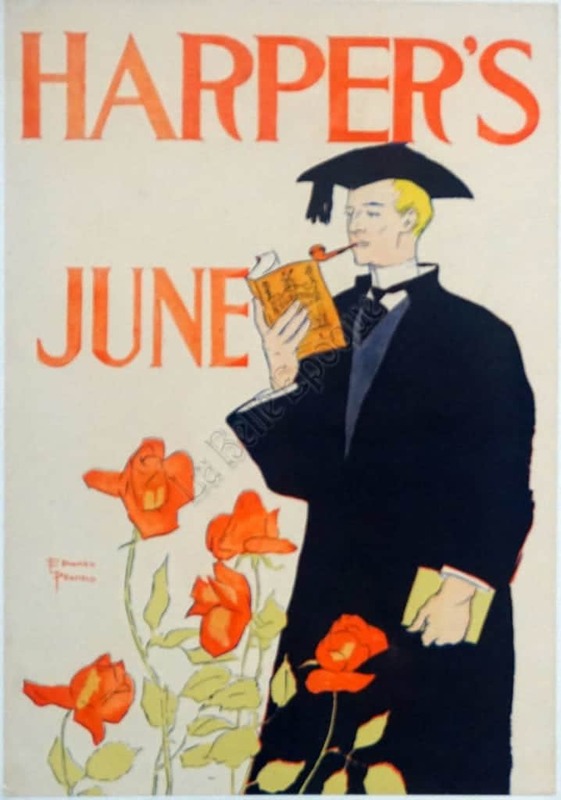 This is a poster for Harper’s June created by Edward Penfield in 1895. This is an excellent example of how Penfield’s work was inspired by French contemporaries, such as Jules Cheret and Henri de Toulouse-Lautrect, and Japanese woodblock prints. This lithographic image features a student in his graduation robes and cap reading a book and smoking a pipe, set to the bottom right of the image. A few roses appear to grow up from the bottom left of the image, their flowers primarily a bold orange color. The rest of the image features “Harper’s June” in its iconic typography, mirroring the same bright orange of the rose petals. Edward Penfield is considered to be the father of the American Poster, and was a leading American illustrator during what scholars refer to as the Golden Age of American Illustration. His use of simple shapes, limited color palettes, and boldly outlined figures allowed his posters to pop from a distance with great clarity. His poster designs strongly contributed to the evolution of graphic design. Harper’s Magazine began as a monthly magazine of politics, literature, culture, finance and the arts; it was created by the New York City publisher Harper & Brothers in June 1850. Harper’s is the second-oldest continuously published monthly magazine in the United States. The early issues of the magazine featured English authors such as Charles Dickens and the Bronte sisters, and later, Americans such as Woodrow Wilson and Herman Melville – just to name a few of the celebrated contributors.